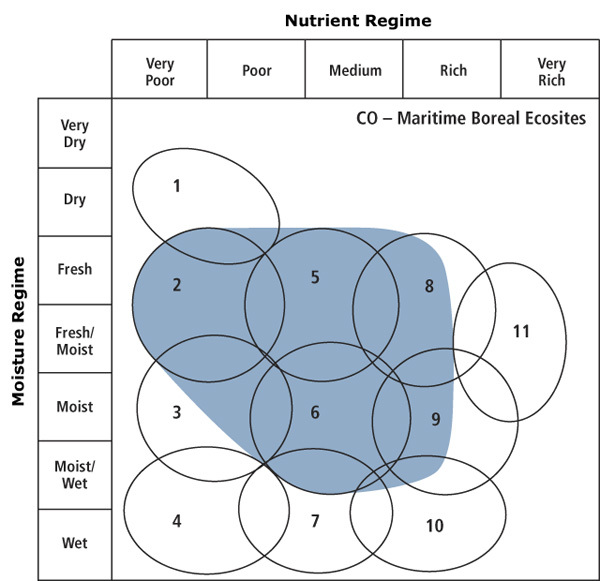 Concept: The composition and vigour of coastal forest Vegetation Types (VT) are influenced by cool, moist climate conditions and exposure associated with the Atlantic Coastal ecoregion and Bay of Fundy shore. These VTs have strong boreal affinities and are considered indicative of Maritime Boreal ecosites. Several plant species are used to indicate this maritime influence. Krummholtz and wave forest conditions are also known to occur in association with coastal VTs. The krummholtz condition is currently recognized as a variant, while more data are needed to characterize the wave forest condition. Acadian Ecosite VTs can sometimes be found in sheltered areas within coastal ecoregion boundaries, but these are not recognized as Coastal Forest group VTs. Vegetation: Crown closure can vary within and between VTs of this group. Black spruce, white spruce and balsam fir are the main overstory species. Red maple and white birch will also reach the upper canopy on more sheltered or distant sites. A suite of plants can be used to indicate coastal influence including heart-leaf birch, mountain-ash, downy alder, bayberry and foxberry. Red spruce, sugar maple, beech, hemlock and to a lesser extent white pine are seldom found in the coastal forest group (except along the Bay of Fundy and Tusket Islands where red spruce is found). Environmental Setting: Vegetation types are mainly found on upper and middle positions of gentle slopes. Soils are mainly derived from glacial till deposits and surface stoniness and exposed bedrock can be variable. Cool, moist climate conditions slow decomposition rates resulting in sites with unusually thick duff layers. Softwood dominated VTs form large patches or matrix forests on the landscape whereas hardwood dominated VTs form small to medium patches. This group is found throughout the Atlantic Coastal (800) ecoregion and along the Bay of Fundy shore, with scattered occurrences along the Northumberland Strait. Successional Dynamics:Vegetation types in this group include both zonal and edaphic climax types. The most common disturbance agents are coastal winds and storms. The level of physical disturbance can be variable with both small and large patches of windthrow and breakage common. Balsam fir susceptibility to insects and disease is also increased in stands weakened by high winds. In more exposed areas, white spruce krummholtz or balsam fir wave forest conditions are found. In the absence of physical disturbance, natural senescence in both softwood and hardwood species limits stand age to 100 to 125 years. Ecological Features: These forests form large patch and matrix stands along the Atlantic and Fundy coasts. Cool temperatures, high winds, salt spray, and elevated humidity and fog are the strongest determinants of stand composition and structure. Most occurrences have dense canopies and well developed bryophyte layers. On more exposed sites, trees may be stunted and wind shorn; in extreme circumstances, krummholtz canopy structures can form. Outside the Cape Breton highlands ecoregion, these are the coldest forests in the province. Most have some boreal affinity, which may or may not be expressed in the understory. Coastal forests provide important habitat for many birds (e.g. black-crowned night heron, osprey, blackpoll warbler, sharp-tailed sparrow, fox sparrow), particularly for those that travel along the coast during spring and fall migration. Near-shore and island stands are used as nesting sites and roosts for great blue herons and seabirds. Older stands may support uncommon orchids and cyanolichens. There is low potential for this group to develop and sustain old growth conditions.